Here is a unique poster book of Canadian Pacific vintage adverting and promotional posters. Let your PWRS sales representitve know if you are interested. Three hundred vintage advertising and promotional posters. During the late nineteenth century and early twentieth century, the Canadian Pacific Railway Company (CPR) was widely hailed as "The World's Greatest Travel System." The Canadian Pacific transcontinental railroad spanned North America from the Atlantic to Pacific oceans. The company also operated luxury hotels and resorts, passenger ocean liners, cargo ships, and an airline. To promote the company and Canada to the world, Canadian Pacific produced more than 2,500 stunning lithographic and silkscreen posters -- 1,000 of which were created in its own graphic studio. 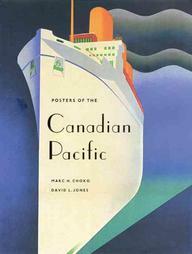 Posters of the Canadian Pacific is a treasury of three hundred of the finest posters published by the company. They were displayed in Canadian Pacific offices and independent travel agencies worldwide from the 1880s until the 1970s. These posters enticed millions to visit and even settle in Canada. The posters span the years 1883-1973 with special focus on the Art Deco style posters of the 1920s and '30s. They focus on travel and leisure -- activities on ski slopes, golf courses, beaches, and luxury resorts. Other posters feature Canadian Pacific ocean liners in exotic locations around the globe such as the West Indies, Rio, Hawaii and the Orient. Posters of the Canadian Pacific will appeal to a wide audience including art lovers, history buffs and railroad enthusiasts.